This issue takes place directly after the last issue ends. 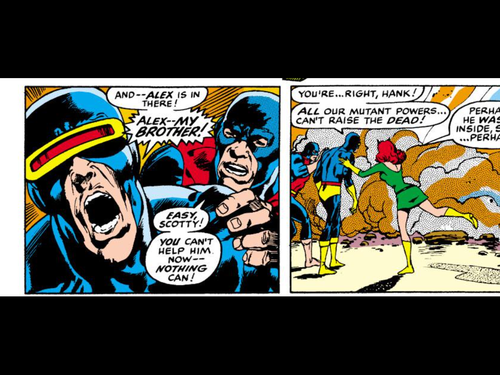 The X-Men have taken the Living Pharaoh prisoner and are trying to transport him away. However, they are ambushed by some of the villain’s accomplices and the Living Pharaoh escapes with Havok as his prisoner. The Living Pharaoh uses a special machine to absorb Havok’s powers and give them to himself. This new power turns the Pharaoh into the Living Monolith. 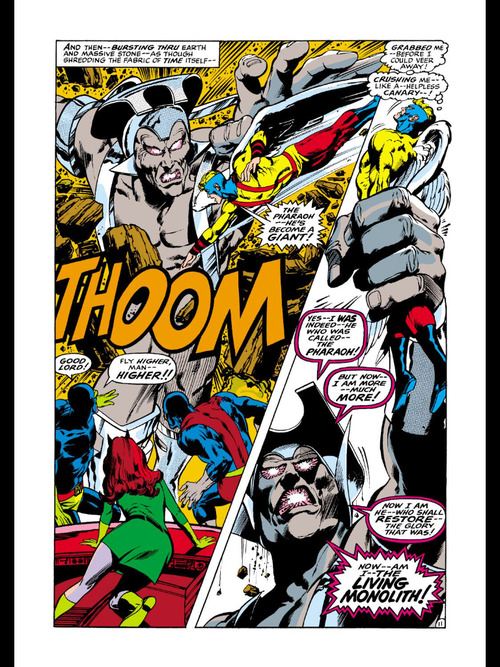 The X-Men arrive and do battle with the Monolith, but are unable to defeat the evildoer until Havok accidentally makes the whole evil base explode. 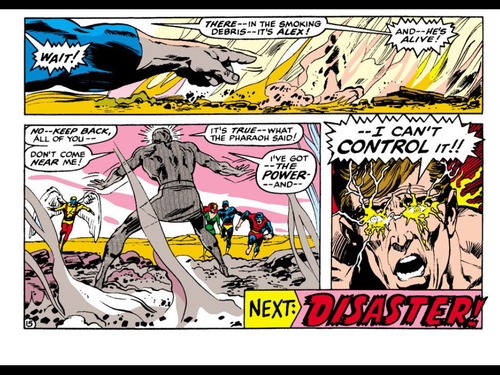 The story ends with Havok telling everyone to stand back because he cannot control his powers. The issue then shifts gears back to the origin story of Angel. When Angel refuses to join the X-Men, the mutant team is forced to fight with Angel. After brawling for a short while, Professor X reveals to them that Angel is unknowingly in possession of a bomb that is due to explode at any moment. To save the everyone Warren takes the bomb into space and disarms it there. Angel is able to come back to Earth safely and then Professor X welcomes him as a new member of the X-Men. I did not completely hate this issue, but it seemed very unnecessary. I thought that the Havok-Living Pharaoh story was over at the end of last issue and I did not need to see it continue. Angel’s origin story also seemed a bit silly and pointless. He accidentally has an atomic bomb? Really? They explain it by saying that Angel took the bomb from burglars after defeating them, but why would petty burglars have an atomic bomb? 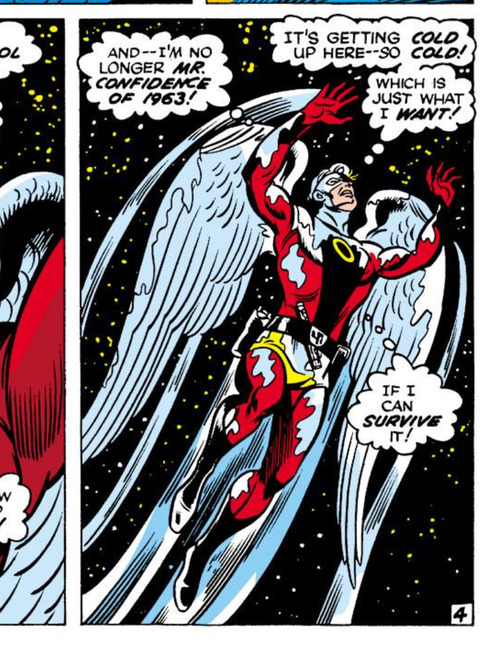 And how can Angel survive going into space with the bomb? I enjoyed the first part of Angel’s origin story, but this finale was a step down. The one thing I do like a lot about this issue is the art. 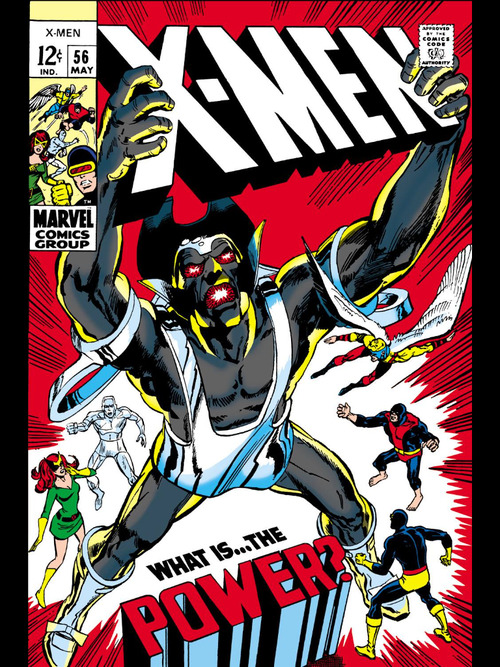 The past few Uncanny X-Men issues have looked really sleek and this one is no exception. Issue 56 definitely looks a lot better than the first few issues. This issue was not very good, but it was still not as bad as the few 1 star issues that I have read so far. 1. 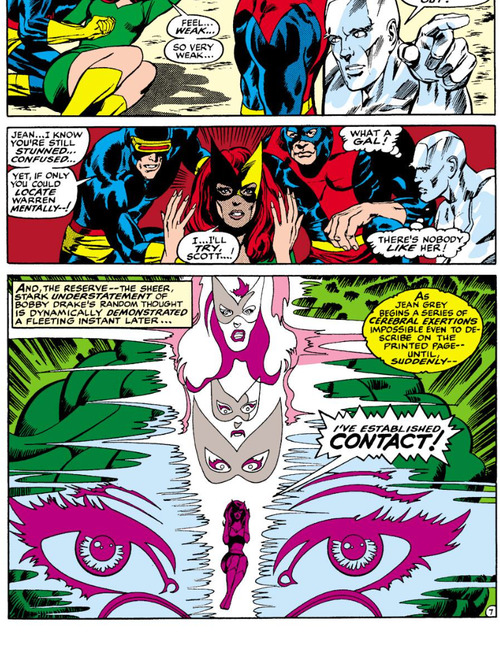 Jean’s telepathic powers look crazy. 2. Why can’t Cyclops go looking for Havok? It is clearly not dangerous to check and see if his brother his alive. 3. 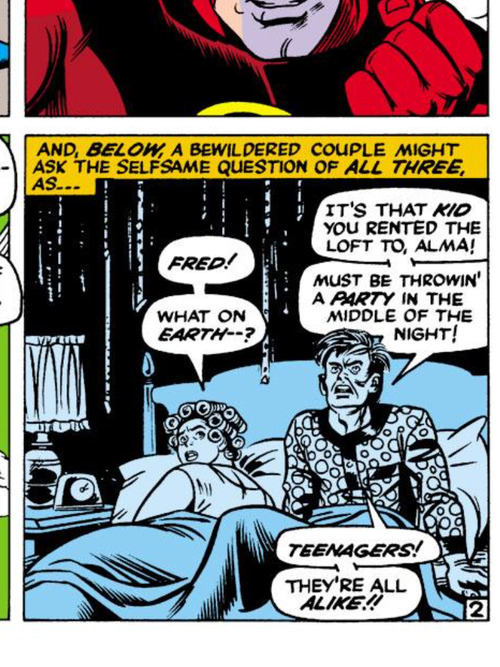 When Angel was fighting the X-Men, his neighbors thought he was having a party and I thought that was hysterical. The story’s only OK. But Neal Adams on art! This period, with Adams on pencils, was easily the best of the original X-Men series. Yeah the story wasn’t good but there have been much worse. And his art really does make everything better! Jean’s powers there look like something from the cover of a Hawkwind album. Yeah it’s a very trippy panel.